Most good leadership and management is common sense. You have to find your own ways of leading and managing. Good leadership and management take time. Are these three statements all true? The number of books published about leadership and management (35,000 listed on Amazon, for example) suggests there must be more to it than common sense - if so, what do you need really to know? We start this section with a very brief introduction to leadership and management, but the key truths are in the other two statements: you do need to find your own ways, and you do need to make time to live these roles well. Quite often these terms are used interchangeably, so that, as Alan Bryman puts it in his review of Effective Leadership in Higher Education, "...distinguishing between them becomes a semantic exercise that is difficult to apply in concrete situations." Asks how and when? Asks what and why? The important point to note is these different roles are both needed in different situations, so it is certainly not a case of management bad, leadership good. You should think about developing skills and expertise in both roles. Think about the people in leadership and management roles in your organisation. How well do they demonstrate the approaches and characteristics identified above? Is there anyone you see as a particular role model? Is that person a manager or a leader, on the whole? Which aspects of these roles do you think you would find most challenging? You have to develop your own approaches to leading and managing. Associated with leadership is an extremely important concept, that of authenticity. 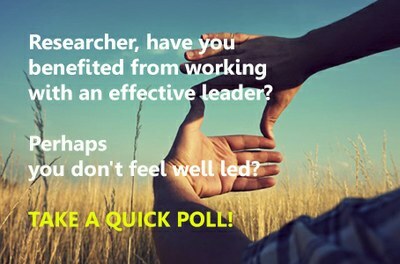 This concept is central to the work of Goffee and Jones who asked the question: Why should anyone be led by you? "Try to lead like someone else - and you will fail." "Be yourself - with skill." Which means, of course, that you have to find ways of being authentically yourself in a wide range of different situations. This is about two things really; developing awareness of what you are really like, and having the confidence to behave in a way that communicates that. The page on Research Leadership styles might help you to identify a way of leading that feels right for you, and finding out more about your own personality type and team role preferences can be extremely insightful and helpful. Your institution may well have someone trained in the use of psychometric tools, such as MBTI or Belbin, and talking to them could be very valuable. (Doing such exercises as a group can be a powerful way of developing both understanding and a team ethos. Talk to your local staff or organisational developers.) Look also at the section on 360 feedback, for an idea on finding out more about how others view you. The confident leader or manager is not the person who displays their abilities by working harder or longer than the team, or who takes on the biggest challenges. The confident leader or manager recognises there are some high-level strategic or interface issues that only she or he can take responsibility for, but there are many tasks that can be undertaken just as well by members of the team - and there may even be members of your team who have specialist skills that you don't have (and this may be just why they are part of the team). And they don't, in fact, have to do things better than you; they just have to be able to do them to an acceptable level. Your time is especially valuable because there are some things that only the leader can do, there won't be much time left after you've done all these. Have a look at the page on time management for more information, and the section on Developing yourself as a PI. You will find time invested in developing your leadership and management skills will be well spent.